In a small bowl, combine the red onion with lime juice and a pinch of salt. Let sit a room temperature, stirring occasionally, until ready to serve. In a large castiron skillet, char the tomatoes and white onion cut sides down, about 5 minutes. Transfer to a cutting board and finely chop. Char the garlic cloves and serrano, about 2 minutes. Transfer to the cutting board and finely chop. Using a mortar and pestle, crush the garlic with a pinch of salt until a course paste forms. Fold in the tomato, white onion, chile and the chopped cilantro. Season with salt. Preheat a grill or castiron grill pan and oil the grate. Season the steak with salt and grill, turning once, until charred and medium rare within, about 8 minutes. Transfer to a cutting board. Grill the mushrooms and nopal, turning, until charred, about 4 minutes. Transfer to the cutting board and thinly slice the steak, mushrooms and nopal. 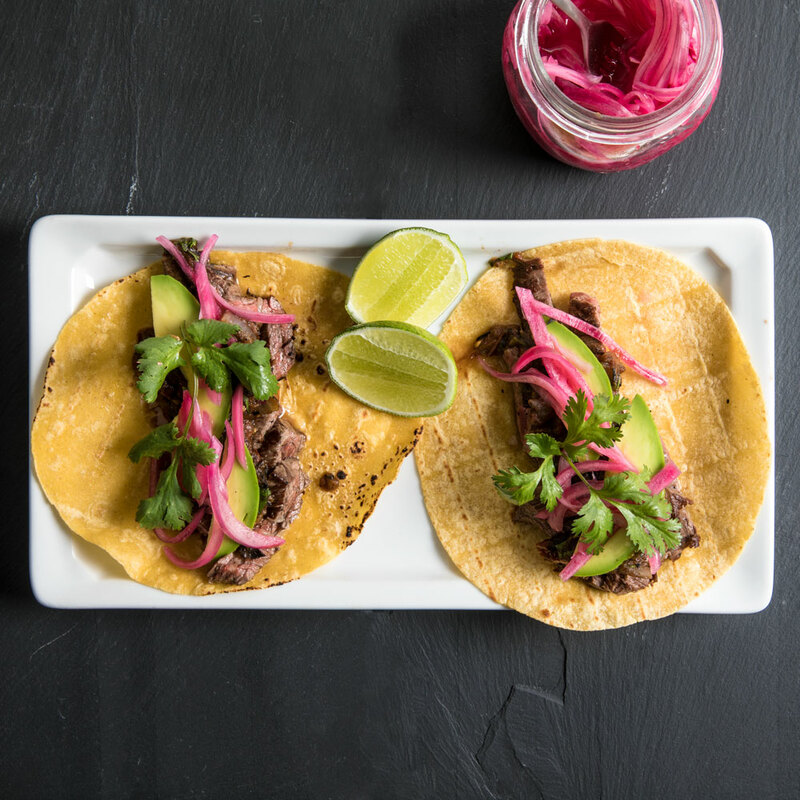 To serve, pile the steak or the mushrooms and nopal on tortillas and top with the salsa, drained pickled red onions, sliced avocado and cilantro sprigs. Review Body: They look like Tacos No. 1! Definitely going to make them! Review Body: My latin friend used to cook a lot of carne asada.